What ‘s Happening on March 2nd ? It’s Dr. Seuss’ Birthday and Read Across America Day! In honor of Dr. Seuss’ birthday, My Creative Books is offering 10% Off on all personalized book orders. Hurry, offer ends at midnight on March 2nd. Use Discount Coupon Code READ2017 at checkout. Share this Special Offer with your friends. Theodore Seuss Geisel, the man known as Dr. Seuss, was an American writer, cartoonist, and a renowed book publisher. Did you know he would be 113 years old this year? He was born on March 2, 1904 in Springfield, MA. Although he is no longer with us, he lives on through his books. So many parents grew up reading Dr. Seuss books and continue sharing these fascinating books with their children. Dr. Seuss is also famous for his whimsical Quotes. Do you remember these? - Today you are you! That is truer than true! There is no one alive who is you-er than you! - You have brains in your head. You have feet in your shoes. You can steer yourself any direction you choose. - The more that you read, the more things you will know. The more that you learn, the more places you'll go. 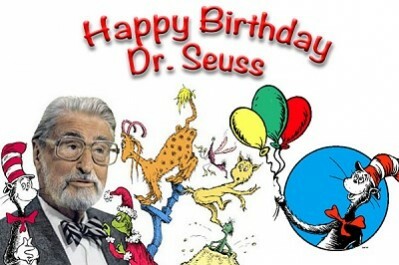 Due to his success and the important role Dr. Seuss’ books have played in the lives of children, his birthday has become a nationwide day of celebrating Reading Across America. Celebrate this day at school, day care center or at home. Plan a party and have the children dress in Dr. Seuss costumes to represent a favorite character, and top it off by reading a good book. Until next time – have a Blessed day! Readers Today . . . . Leaders Tomorrow!